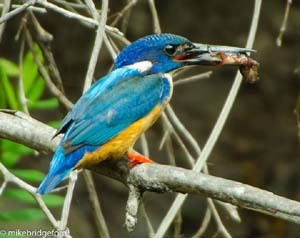 Half-collared Kingfishers generally nest in the banks of flowing streams and ensure that their nests are positioned amongst roots and tangled vegetation for protection. [see photo below]. The hole is about 60cm long and 7cm in diameter. One such nest was located in the banks of the Krom River in Nature’s Valley. Bruce Ward-Smith and Mike Bridgeford spent many hours watching the nest area and observing the bird’s behaviour and photographing their activities. 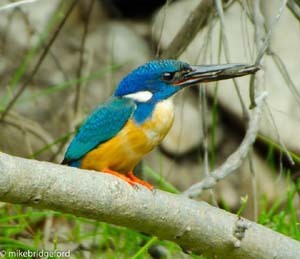 The Robert’s Reference Book notes that the sexes are alike, but that the female has an orange colour on the lower mandible. We noticed that both birds going into the nest has some orange on the lower mandible – so we would question the observations made in Roberts. We would presume that the two birds attending the nest are a pair – male and female! One bird always remained in the nest, and at change over time, the exiting bird would dive into the water after exiting the nest hole. Change over time was between twenty minutes and a half hour. The incoming bird always carried prey, mainly tadpoles and small fish, so the presumption was made that they were feeding chicks. We will continue to monitor the pair and hopefully we will be able to capture the first flight of the chicks. Their incubation duration is given as 16 days, and the nesting duration about 27 days.